Notre Dame-West Haven’s Michael Card, right, celebrates with teammates after scoring his second unassisted goal in the third period against Northwest Catholic in the CIAC Division I semifinal at Ingalls Rink in New Haven on Wednesday. NEW HAVEN — The senior night that led into the postseason, the bus rides to New Hampshire and Massachusetts, the young arrivals on the ice and the new veteran coach behind the bench: They’ve all led Notre Dame-West Haven to this point, an unexpected state boys hockey final. Mike Card scored goals five seconds apart in the third period Wednesday, turning a deficit into a 3-2 win over Northwest Catholic at Ingalls Rink in the CIAC Division I semifinals. After a regular season where their record seemed attracted to .500 like a magnet, the Green Knights are in their 18th state final. “Definitely just bonding together” got them here, said Card, a senior. Both goals came off faceoffs, with Jack Luzzi at the dot, popping the puck out to Card, he said. Card scored the first on the backhand, cutting across right to left and firing back inside the right post. He came up the right wing to score the second, with 9:01 left. “I couldn’t script that any better,” Card said. Sixth-seeded Notre Dame-West Haven (13-9-1), ranked seventh in the GameTimeCT poll, advances to its 18th state final, Tuesday night at 7, also at Ingalls Rink. 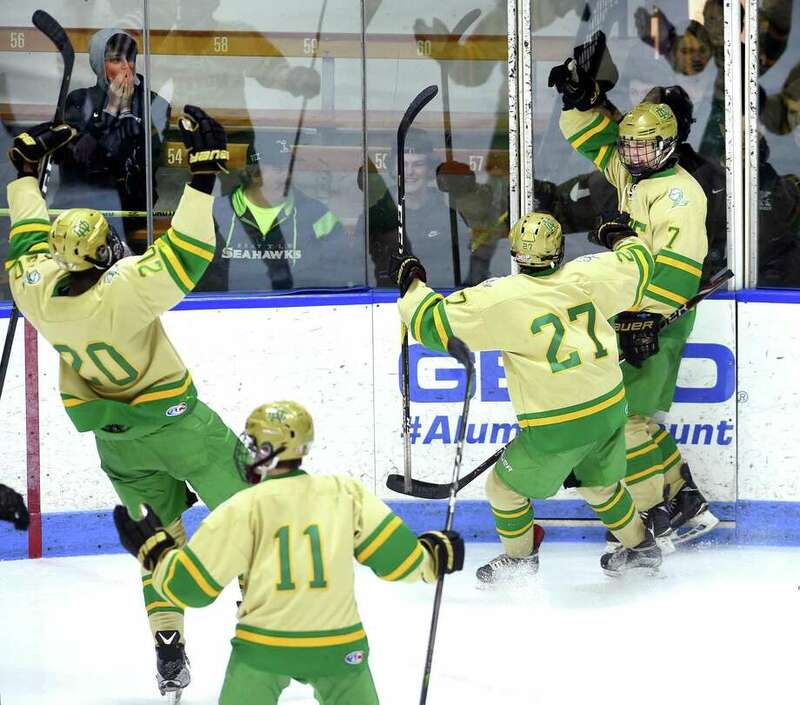 The Green Knights will seek their eighth championship against either fifth-seeded Fairfield Prep (13-9-1) or eighth-seeded Xavier (10-10-2). Second-seeded, fourth-ranked Northwest Catholic finishes 20-3-1. Mike Card ties it up for NDWH on this goal here. The Lions started the season 6-0 and 10-0-1. Their seventh win was at home on Jan. 12, a 3-1 win over the Green Knights. Since he arrived at Notre Dame in September, coach Larry Vieira had said it was about the end of the year with the Green Knights, meshing new players together with a new coach. They’ve won five in a row since their senior night, a 5-1 win over Vieira’s former program, NFI. “It’s about unity, I know it sounds redundant, and it’s about teamwork,” Vieira said. Nathan Loitz pounced on a rebound on a power play to give the Lions a 2-1 lead with 1:29 left in the second. Both goalies had put on a show for most of the second. Just in one sequence, Green Knights sophomore Connor Smith made two stops on Brennan Horn alone in front, and when Notre Dame went the other way two-on-one, Lions senior Mike Kaliff poked the puck away from Ian Hayden cutting to the net. The teams traded first-period goals, the Lions’ early, the Green Knights’ late. Horn took a stretch pass from defenseman Branden Waitt for a breakaway goal in 1:29 into the game. Notre Dame tied it on a goal-mouth scramble with 1:15 left in the first as Ian Hayden put away the rebound of his initial shot. Records: Notre Dame-West Haven 13-9-1; Northwest Catholic 20-3-1. Goals: NDWH—Mike Card 2, Ian Hayden; NWC—Brennan Horn, Nathan Loitz. Assists: NDWH—Rory Andriole, John D’Errico; NWC—Branden Waitt, Horn. Goalies: NDWH—Connor Smith (28 saves); NWC—Mike Kaliff (31). Shots: NDWH—34; NWC—30.